Dr. Hubertus Hoffmann, Founder and President of the World Security Network Foundation, at the traditional Christmas market in Munich: "I see more hope and light than fear and darkness in both our world and foreign affairs. I wish you and your family a happy Holiday Season, a Merry Christmas and a peaceful new year 2008 "Networking a Safer World" with us." 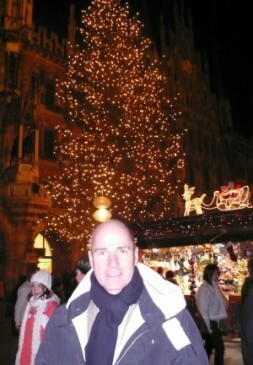 Enjoying the Tannenbaum (Christmas Tree) at the traditional Munich Christmas market in Bavaria, the Gluehwein (warm spiced red wine), the music and the many small shops with Christmas gifts and decoration, I see more hope and light than fear and darkness in both our world and foreign affairs. Today you can travel from Munich via Prague, Warsaw to Tallinn or from here via Vienna to Slovenia without any border controls. This is a miracle of the European Union. Only 63 years ago World War II destroyed Europe. Just 17 years ago the Iron Curtain blocked free travel from East to West and meant strict border controls from West to East. The situation has been transformed beyond recognition. Islam and Christianity are now in intensive dialogue via their leading figures: see the visit of the Saudi King to Pope Benedict XVI in Rome. The CIA report on Iran and its potential nuclear weapons programme showed us two positive things: first, that in U.S. democracy and the Administration there are independent, high level personalities and professionals. Second, that in 2003 Iran had already stopped their nuclear weapons program as a political decision following Western demands. I am convinced this is only for a few years with a priority on fuel instead of arms technology however. I think that the chances of a peaceful solution with Iran are 50 percent now assuming the West maintains pressure and dialogue with moderate forces in Iran. With the selection of pro-business Dmitry Medvedev, Vladimir Putin has selected an excellent young politician as the next President of Russia instead of the much too narrow-minded Sergey Ivanov. The West has mainly ignored this. We need to see the Russian glass of vodka half full rather than half empty. Putin has also learned that his victory would have been twice as prestigious if he had allowed the opposition more oxygen. This is something Russia will need in order to balance the over-mighty bureaucrats and develop a strong and balanced Russian democracy. I remain optimistic for Russia. The number of killings in Iraq has dramatically declined and the terrorists have lost one village and city after another. Pakistan has lifted martial law and the generals there have shown professional patriotism, including a much better control system of Pakistan’s nuclear arsenal. North Korea said goodbye to its nukes; something no-one expected. This was well managed by Beijing, the US, South Korea and Japan. China has learned that Darfur is both bleeding and damaging to the Chinese national interest. I hope Beijing will announce diplomatic relations with the Vatican in 2008; current top secret negotiations are doing well, facilitated by Italians and international China experts. In Sarajevo, the capital of Bosnia Herzegovina, the former Serbian general Jovan Divjak helps children whose families were victims of the war. He is executive director of the OGBH NGO. Please have a look at this association "Education builds Bosnia and Herzegovina", a non profit organization. Until 1991 he was Defense Chief of the Yugoslav Army in Mostar and Sarajevo; the aggressor. He changed sides to join the Muslim defenders of Sarajevo and become Deputy Commander of the Bosnian Defense Forces 1992- 1997. He is our WSN Hero 2008. There are more than 30,000 children without one parent and more than 2,500 orphans in Bosnia and Herzegovina. Those children need help to overcome the tough consequences of trauma in the 1992-1995 war years. Please add your own positive events and pray for a peaceful 2008. As Christmas food for thought, I add a famous internet letter from Dr. Bob Moorehead about "The Paradox of our Age" as well as the papers of the World Security Network Foundation working group on Christian peace policy and moral relativism. I wish you and your family - as one of 320,000 who receive this WSN Christmas newsletter - a happy Holiday Season, a Merry Christmas and a peaceful new year 2008 "Networking a Safer World" with us. You'll Never Guess What These Landlords Want as Payment!